Volume 3, Number 11 of the first student newspaper on the CSUSM campus. The cover story reports on controversial comments from Senator Craven and CSUSM professor featured in the film Like Water for Chocolate. 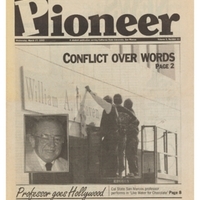 March 17, 1993,” University Archives at the CSUSM Library, accessed April 18, 2019, https://archives.csusm.edu/student-newspapers/record/58.